ATLANTA — Nearly all motor carriers subject to the federal electronic logging device mandate have complied with that regulation, but another significant transition remains for fleets still using older e-log systems that predate the ELD rule, industry experts said. 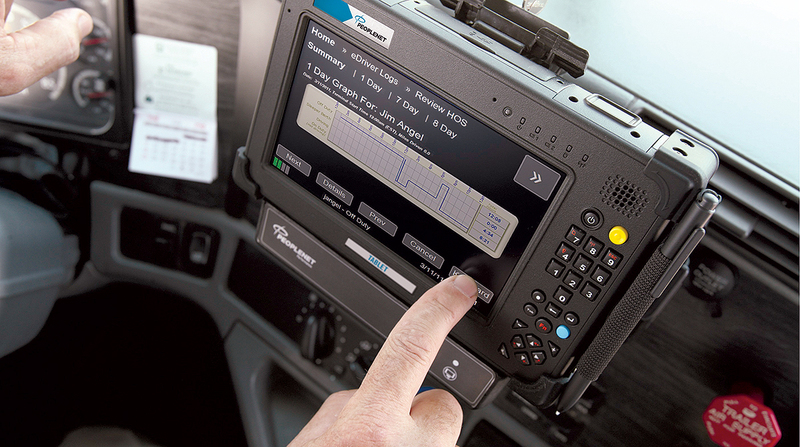 The mandate, which went into effect a year ago, requires most longhaul trucking companies to record drivers’ hours of service with ELDs instead of paper logbooks. But the rule also allowed early adopters of e-logs to continue using their existing systems, classified as automatic onboard recording devices, or AOBRDs, for two additional years. Many fleets that already had installed AOBRDs chose to take advantage of that two-year grandfather period rather than migrating immediately to ELDs, but that exemption is set to expire Dec. 16, 2019. Carriers still running AOBRDs have until that date to update those systems to an ELD platform, and that transition “will probably not be painless” for fleets and vendors, analyst Clem Driscoll said here Nov. 27 at TU-Automotive’s annual Connected Fleets USA conference. The long-anticipated implementation of the ELD mandate has brought opportunity and challenges for commercial-vehicle telematics providers, said Driscoll, who is president of research firm C.J. Driscoll & Associates. Total revenue in the U.S. trucking telematics sector has doubled since 2015 to $1.1 billion, largely due to the mandate, said Driscoll, who shared highlights from his firm’s 2019-20 U.S. mobile resource management systems market study. But in the final weeks leading up to the mandate, ELD suppliers struggled to keep up with product demand and support calls from a large portion of carriers that waited until the very end to install the devices in their trucks, he said. “At this point, nearly all commercial trucks operating in the U.S. that are subject to the ELD mandate are equipped with either an AOBRD or an ELD,” Driscoll said. “When you have all these carriers moving from AOBRD to ELD, there will be challenges across the board,” regardless of the technology vendor, he said. Fakkema estimated that half of Zonar’s fleet customers still are on AOBRDs. Like many other vendors, Zonar plans to provide over-the-air software updates to convert current AOBRDs into fully compliant ELDs, but Fakkema warned that fleets will need to carefully manage that process. He also recommended that fleets establish or revise company policies to mirror the ELD rule’s language on issues such as editing driver logs and the use of vehicles for personal conveyance. In addition to the AOBRD sunset, many fleets soon will need to replace telematics hardware that runs on 2G and 3G wireless networks, Driscoll said. Major U.S. cellular carriers are phasing out those older networks to free up spectrum for faster 4G LTE devices. Verizon, for one, plans to complete its 2G and 3G shutdown at the end of 2019. Fakkema also assessed the ELD mandate’s effect on the trucking industry in the first year since it went into effect. He cited data from the Federal Motor Carrier Safety Administration indicating that HOS violations are down 48%, but he suggested that most of that reduction has come from eliminating form-and-manner violations caused by drivers failing to fill out their paper logs properly. Fakkema said “the verdict is still out” on whether the ELD mandate has achieved its ultimate goal of improving safety but added that he expects more data to become available in the next few years to provide a clearer picture. Even though most motor carriers now have equipped their vehicles with some form of telematics, Driscoll said technology suppliers still will have a large opportunity to provide those carriers with more fleet management services and features. He also noted that a growing number of technology vendors are integrating onboard video with telematics to help fleets reduce accident liability, coach drivers and monitor driver fatigue. While the top of the commercial-vehicle telematics market has seen significant consolidation in recent years, including Verizon’s acquisitions of Fleetmatics and Telogis, new players have continued to emerge at the same time, Driscoll said.